Taking a bespoke approach to design, the recently completed Crown Towers in Perth by Bates Smart features refined detailing, along with an exhaustive collection of art procured by FORM. Crown Towers Perth boasts 500 elegant and spacious guest rooms, suites and villas. 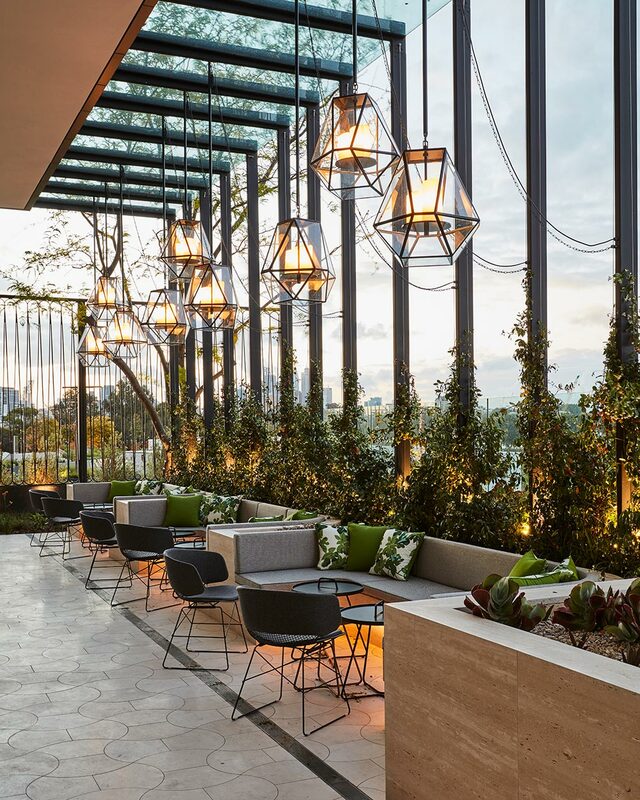 Drawing influence from the Western Australian landscape and the world’s best international design benchmarks, the practice has imparted its signature design ethos of restrained luxury on the public spaces of the resort hotel. Having a 24-year long relationship with Crown Resorts, Bates Smart has built an in-depth knowledge of the chain’s operational and branding requirements. 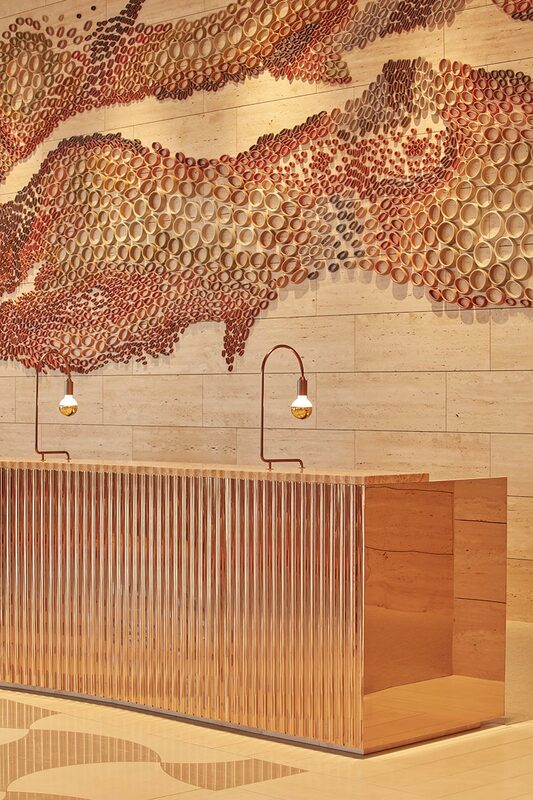 The lobby counter with a sculpture by Ian Dowling consists of 8,000 separate ceramic pieces. Bates Smart’s interior design director Jeffery Copolov, who worked closely with interior design associate director Kendra Pinkus, says Crown Towers will be a significant contribution to the city of Perth and further the trademark Crown Towers’ design aesthetic. 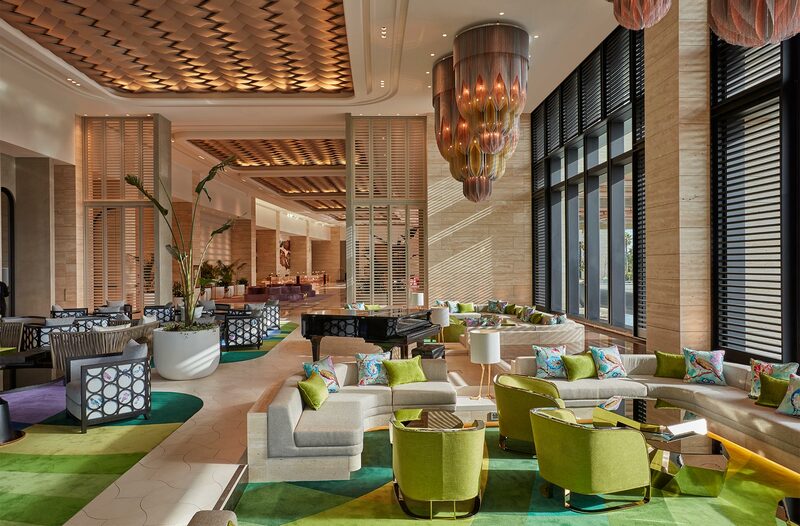 “Crown Towers Perth is an impeccably luxurious hotel with an unmistakable core of world-class design,” Copolov said. Crown Towers Perth is positioned overlooking the Swan River, which is reflected in the interior decor, along with reflections of Western Australia’s vast, open clear skies, vibrant, saturated colours of the outback and the endless azure of the Indian Ocean. 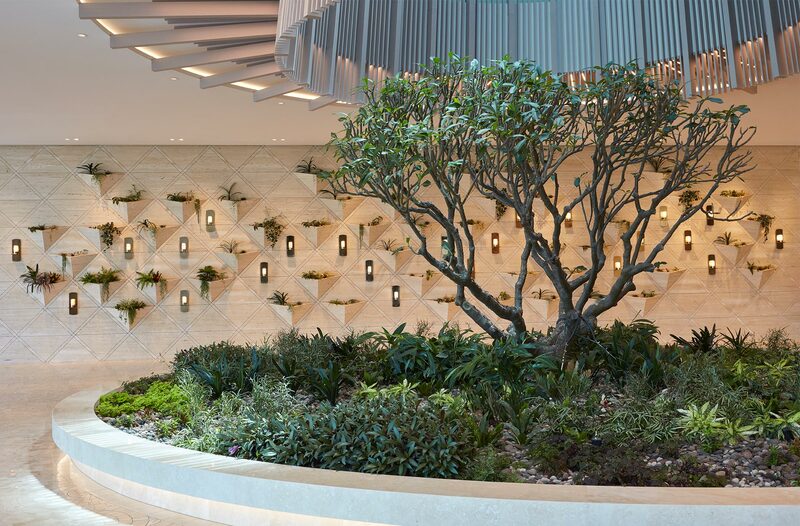 A seamless transition between indoor and outdoor areas allows the surrounding landscape to filter through the interiors, ensuring the resort design is always in harmony with its setting. “Guests, whether local residents or travelling from across the globe, are now searching for an experience in their hotel stays,” says Copolov. Finding inspiration in the finest colonial hotels of the past, Bates Smart has incorporated contemporary design details that re-interpret and capture the essence of a romantic bygone style. Elements such as arches, shutters and textured surfaces diffuse the searing sunshine, creating dappled light and shade while tempering heat. Upon arrival, guests immediately experience a refined sense of glamour with glistening reflective pools that extend from the porte-cochere to the inside lounge areas of the reception and lobby bar, reflecting natural sunlight by day and the sparkling lights of dusk. The bars evoke high-end glamour. On entry, a bespoke set of four chandeliers is the striking visual focus. Created in collaboration with Adam Hoets, South African architect and creative director of lighting designers willowlamp, the lighting features are made up of more than 20,000 metres of intricate ball chain. Rendered in hues inspired by precious Australian metals, each chandelier measures over five meters wide and weighs over three tonnes. Travertine walls throughout the lobby are a backdrop to the major commissioned artwork by local Western Australian artist Ian Dowling. 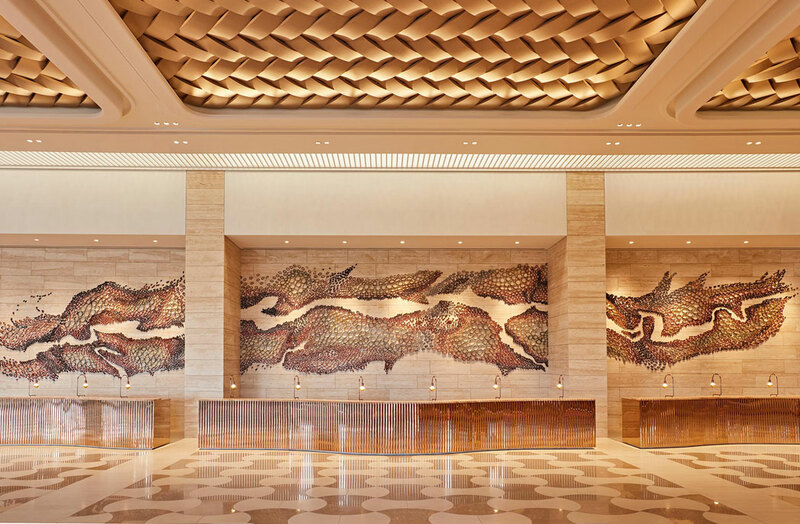 Flowing behind the shimmering, sinuous reception desk and comprised of 8,000 separate ceramic pieces, the artwork reflects some of the shapes and features of an aerial view of the Swan River. The ceilings are finished with oversized basket weave panelling that further evokes colonial hotel design. A large-scale floor pattern, rendered in limestone, grounds the heroic size of the lobby and acts as base for the richly detailed materials throughout the space. 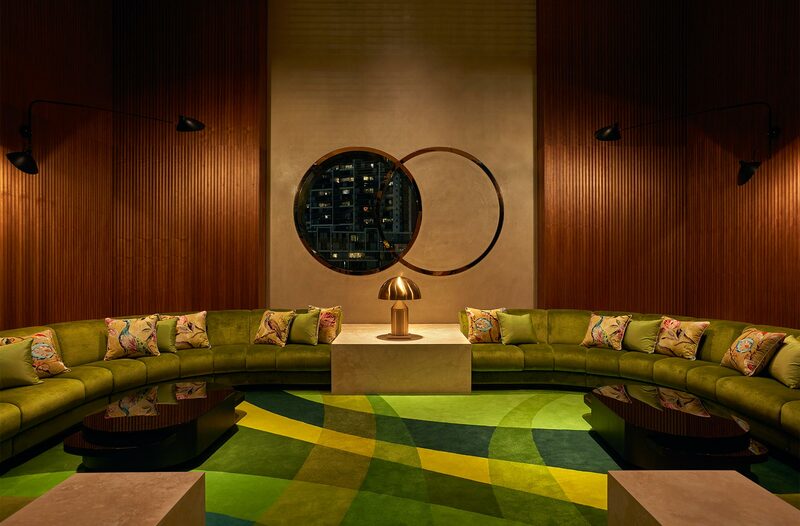 Bates Smart worked with New York-based textile designers Doug and Gene Meyer to create the remarkable custom designed carpets that dress the pre-function corridor. Inspired by 1960s fashion prints, the design was produced by Brintons. Bespoke light fittings that resemble intricate suspended copper birdcages have been installed in the bar – theatrical feature plays against the delicate woven rattan pattern. The bar features custom copper birdcage lighting features. 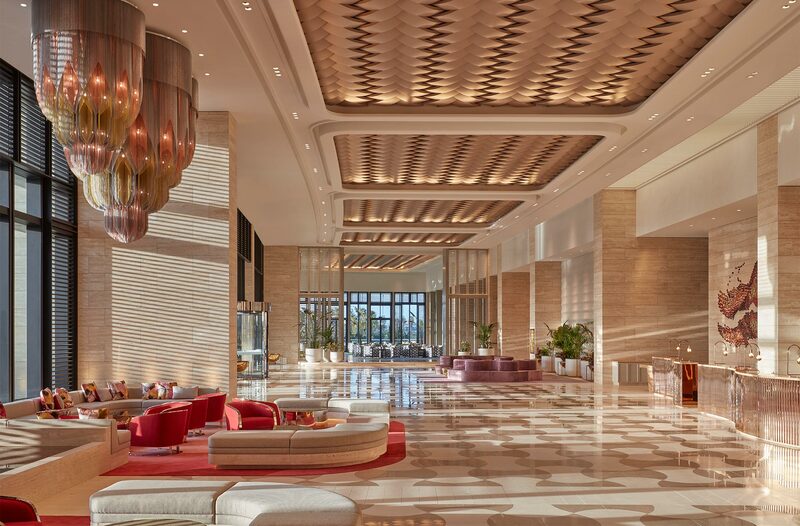 The lobby’s grand proportions are rendered in a neutral palette inspired by the Western Australian earth and coastline, with red accents that reference the area’s native wildflowers. Seating arrangements throughout the lobby provide places to gather for spontaneous encounters, settings for work and networking, as well as a space to unwind and simply contemplate the surrounds. Skylights run the length of the 150-metre long corridor, allowing natural light to bathe the area and illuminate the richly hued carpets. Linked by this pre-function corridor are two grand ballrooms, a formal boardroom, business centre and numerous meeting rooms of varying sizes. The exterior wall treatment of the ballrooms is reminiscent of a lacquered jewellery box, finished in soft neutral tones with black trim accents. Arches of rolled metal are repeated on all walls and outward facing windows are adorned with shutters, providing continuity to the lobby’s design. The outdoor terrace bar, one of four components within the program of spaces. The ballroom’s grand interiors extend the hotel’s bold theme of strong colour and geometry, demonstrated by the dramatic, large-scale contemporary chandeliers. The hotel’s lobby bar is broken up into four components: outer bar, inner bar, outdoor terrace and private VIP area. 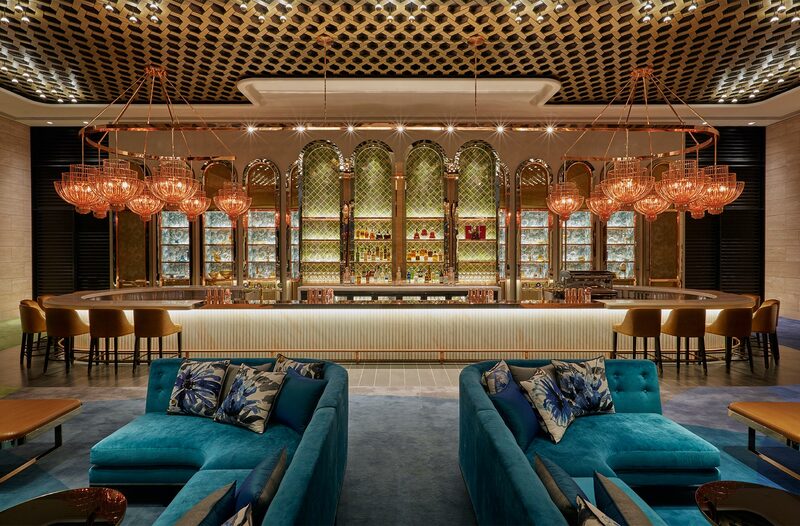 The outer bar area acts like a conservatory, set in jewel-like colours of rich blues and greens, connecting to the water features and garden terraces beyond. The use of hand painted fabrics speaks to the flavour of Palm Springs resort design. A travertine marble wall detail brings greenery into the interior. Passing through an arched colonnade, the inner bar’s darker tones turn moodier, with rich turquoise and emerald accents. Central to the space is a striking horseshoe shaped bar – theatrical in appearance and created from curved, fluted fingers of pink and white marble. 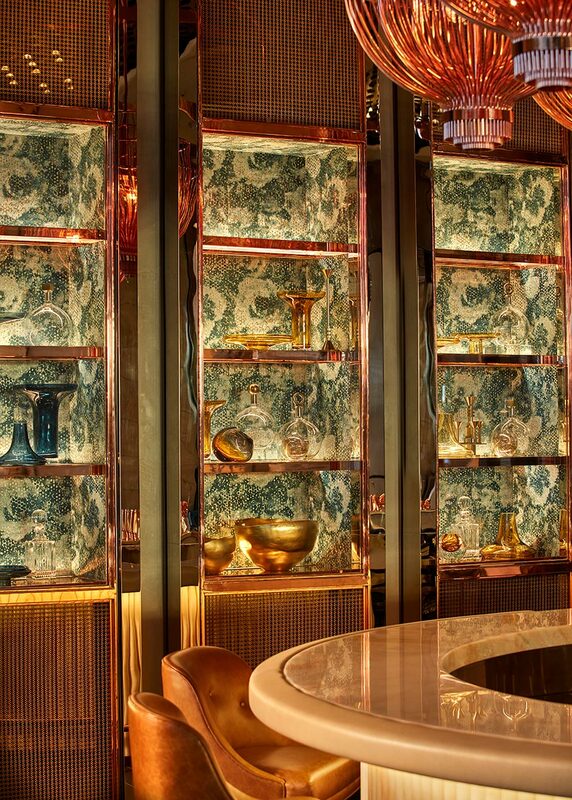 Copper metal detailing trims the back bar that features handmade iridescent glazed tiles. All photography by Sean Fennessy.